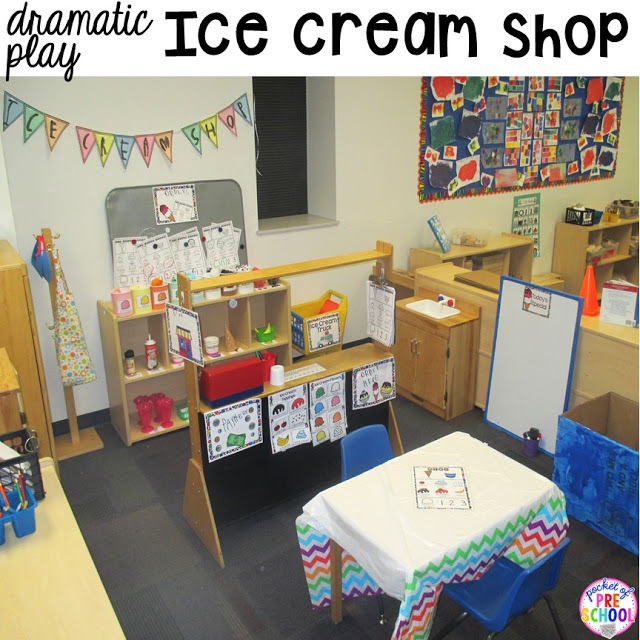 The Dramatic play center is a place students can go to pretend, imagine, and be creative. Students can pretend to be anyone and do anything! This is powerful for our little learners. It is a place that promotes high-level thinking, problem solving, turn taking, and is rich place for teaching vocabulary. 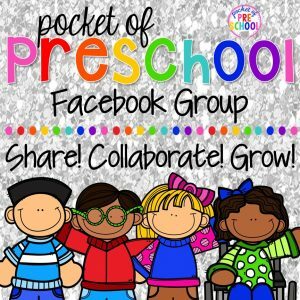 Students can learn and develop skills in all learning domains (language, literacy, math, science, social studies, fine motor, gross motor, and social skills) through pretend play. 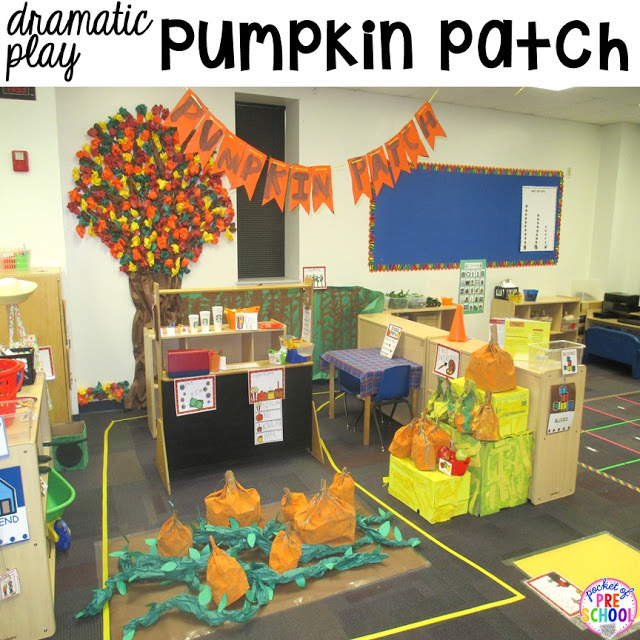 The Dramatic play center is an amazing place in your classroom if you are intentional with the materials and experiences you plan and set up for your students. Every year our Dramatic play center is home living the first month of school and the last month of school. Home living is something every child can relate to and can enjoy. 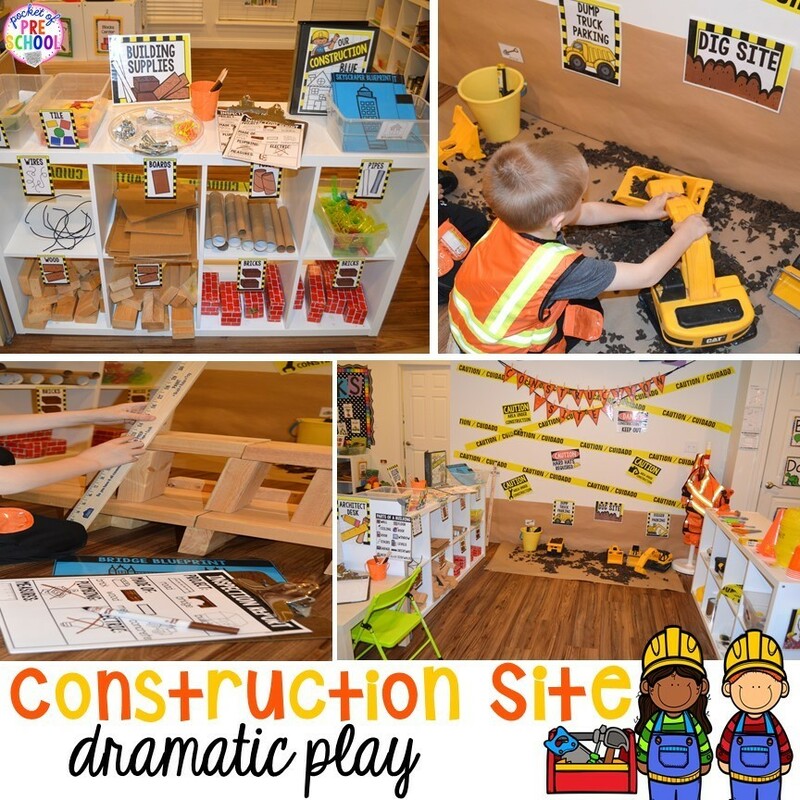 You can check out all of my dramatic play units HERE. Label everything in your center so students (and teachers) know where everything goes. It makes clean up so much easier for students. Your labels can be photographs of the props you use, or use Clip art. Be sure to pair the picture with the word on your labels. Students will “read” the labels and notice the letters as they use and clean up the props. Each one of my Dramatic play units comes with the labels for the center! Add props slowly and intentionally. Don’t be afraid of empty or bare shelves especially at the beginning of the year. When school started some of my shelves were empty. Imagine the shelf above without the recipe book, cookie jar, blender, pitcher, and tub of material. That is what it looked like on the first day. Other kitchen props you can add are a coffee maker, cleaning supplies, mixer, and toaster. Add props based on what students are playing. For example, one week I observed students pretending to make cookies so the next week I added a recipe book and cookies. Another week, I observed students pretending to sleep so the next week I added a tub of materials for students to use as blankets and/or beds. (Just a note: I add new items to all my classroom centers every Monday). One of the first things students do is decide who they want to pretend to be. Students will start to make a plan for play. They will discuss who they want to be and what they want to do. To do this we use role necklaces in my classroom. 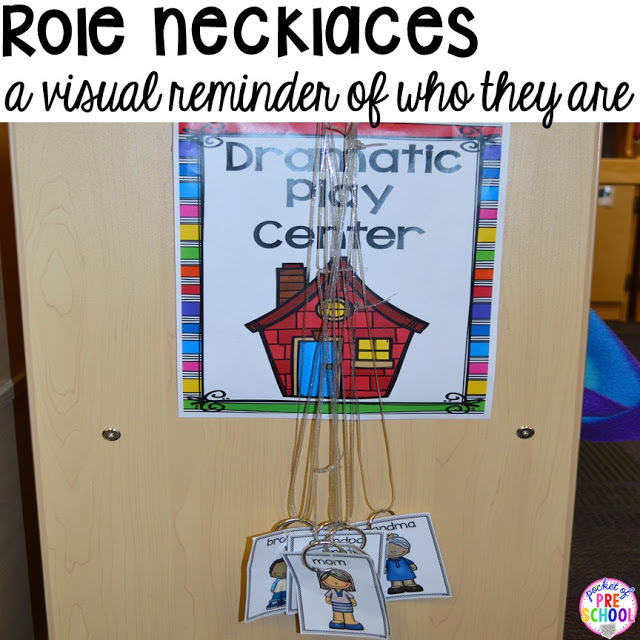 Role necklaces help students identify who their friend is pretending to be. It is also a visual reminder for the child wearing the necklace to help them remember who they are pretending to be. Providing a variety of dress up clothes, shoes, accessories, and hats make pretend play more fun! Plus all the putting on and taking off is great for strengthening fine motor muscles. Clothing and accessories are a fabulous way to infuse other cultures into your classroom too! Food! Every home living center needs food. Have a variety of food to support all your students. Put out plastic, realistic food for your younger students and food containers for your older students to support imaginary play. I LOVE adding watered down paint to the inside of bottles and jars to make the props more eye appealing for students. For example, I coated the inside of the jelly jar with purple paint. My favorite realistic food props are Melissa and Doug eggs, cookies set, sandwich set, pizza set, and pasta set. Use small manipulatives (or pom poms) for food to support imaginary play. This friend is pretending these pom poms are green beans. Students use higher level thinking during imaginary play. You can find these small pots here. Do you need more pretend food? Have the students make it! In a small group my students used Model Magic to create these yummy popsicles. Air dry clay works well too. When students make props for the Dramatic play center, they are more invested in their play! Students LOVE babies. Don’t forget to add a few other baby items too such as baby food jars, baby spoons, bottles, diapers, and/or baby clothes. When you add babies, it allows students to practice taking care of someone else. You are also teaching them to be kind and care for others (aka character education). Adding pets is something new I have added to my home living center the past few years and the students LOVE it. Students can pretend to care for the animals and practice being responsible. It is an easy way to sneak in some social studies and science too (wants and needs)! Be intentional and plan reading and writing opportunities for students. As students play, they are reading the labels, reading a recipe, writing a shopping list, and reading the labels on props. We all know how important and powerful environmental print is. It is super easy to add tons of environmental print into your Dramatic play center. Put empty food containers in the refrigerator, restaurant menus by the phone, and store ads by the shopping lists. Students will be reading constantly during play! Now that you have embed writing and reading into their play, plan and create a few math opportunities too. Sort your cups by size and add a real or pretend clock. Add measuring spoons and cups for students to measure ingredients when they are cooking. Add cooking utensils that are different sizes and colors. Don’t forget the walls. Add a window and make your home come to life. Hang photographs of students and their families on the wall too. Another easy way to infuse culture in your center! 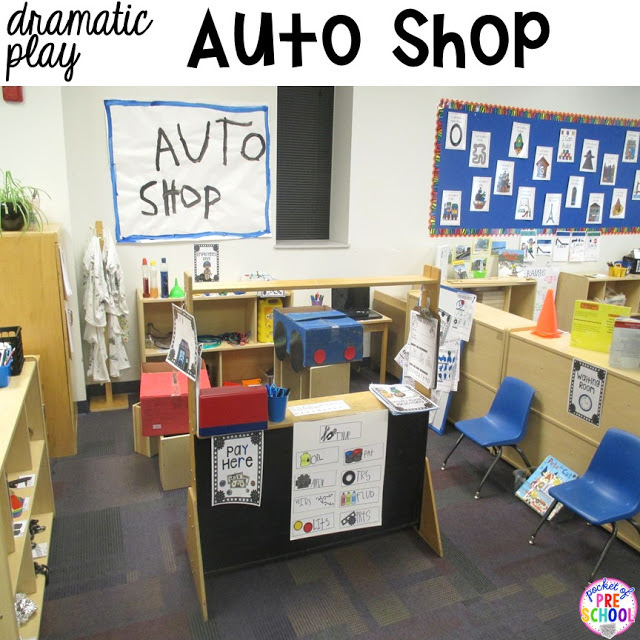 Change it up, don’t have your dramatic play center be a home all year. Your students will get bored and we all know what happens when students are bored….challenging behaviors. For the first month and last month of the school year, the dramatic play center is a home. Then with each theme, we change it into a new place! Based on the season and student interest we change it into something new every theme. The students help me brainstorm what props we need and who we can pretend to be. They help me make props, create the signs, and we set up the center. The center is closed for play the first few days when we are setting the new place up. Last fall, we changed it into a Pumpkin Patch! Each week I slowly added props and this is what it looked like at the end of the unit. (The yellow line on the floor was our corn maze). Keep reading to check out a few more of my favorite dramatic play themes. Books, books, and more books! Read books about your theme to build students background knowledge. They will use their new knowledge and vocabulary during play. You will observe their play scripts become longer (what students say when they are pretending to be someone), their number of play interactions will increase and their play will accurately reflect real life. Monica Wellington is one of my favorite authors. Her books are amazing and support Dramatic play. Stuart Murphy has some books in his Math Start series that are fun to use. Lucy Cousin writes a series about the mouse Maisy. The books have simple text and illustrations that are perfect for younger learners. Don’t forget to read non-fiction books to support their play too! Some of my favorites are: ABC Jobs, A Day in the Life of a Zookeeper, A Day in the Life of a Veterinarian, Families in Many Cultures, Let’s Ice Skate, What We Wear, Buying a Pet from Ms. Chavez, and Mr. Yee Fixes Cars. Feeling inspired but don’t want to spend ALL your time creating all the labels, signs, and prop patterns? Don’t worry. I’ve got you! In my TPT store, you will find 22 different dramatic play themes (including home living). 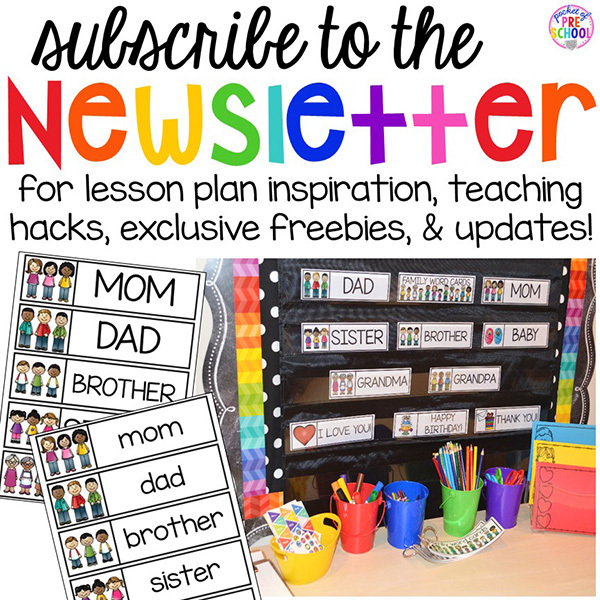 Each includes a teacher planning web, possible props list, parent letter, labels, signs, role necklaces, prop patterns, real classroom photographs, and MORE! Just click on any image to check them out. Like it? Pin this image for later! Need more inspiration? Check out my Dramatic Play Pinterest board.